There was a big announcement on Wednesday in the advertising world. Twitter finally launched a keyword targeting solution for Twitter Ads. Yes, that means AdWords-like targeting for Twitter. Many in the industry (including myself) have thought for a long time that Twitter should launch something like this… and it’s finally here. What is Keyword Targeting in Twitter? Let’s start with a quick introduction. With this new release, advertisers can now promote certain tweets based on keywords that users are searching for on Twitter, based on keywords used in their tweets, or based on keywords found in tweets users recently engaged with. When a match is made, your promoted tweet has an opportunity to win placement either in a user’s Twitter stream or in the search results (for when someone searches Twitter). In your Twitter Ads dashboard, you should click “Create campaign” in the upper left-hand corner. 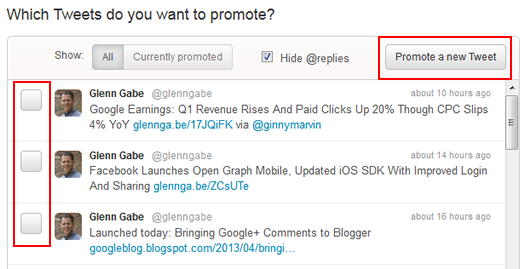 Next, click the “Promote your Tweets” button to select a promoted tweets campaign. Once you select a promoted tweets campaign, you should click the button labeled “Target by keywords” to create a keyword targeting campaign. When you decide to launch a keyword targeting campaign in Twitter, you’ll have to decide if you want to target the search results or users’ timelines. I like that Twitter forces you to break out campaigns by type, since I would have recommended doing that anyway. 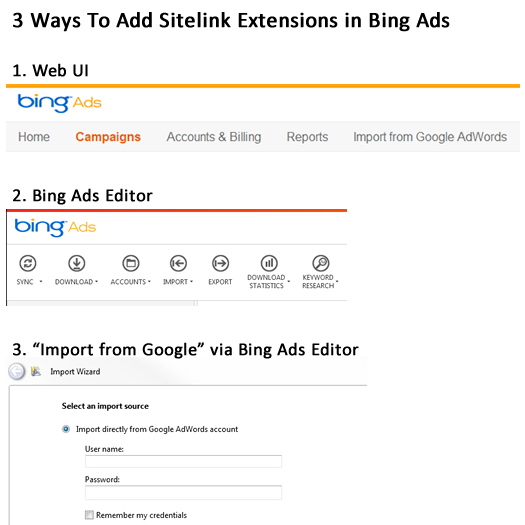 This will enable you to better analyze the effectiveness of your targeting (very similar to breaking out display network and search campaigns in AdWords). 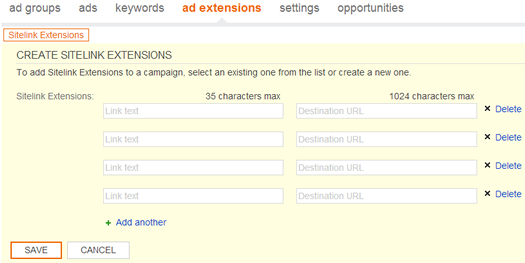 Next, you’ll need to address the keywords you will target for your campaign. 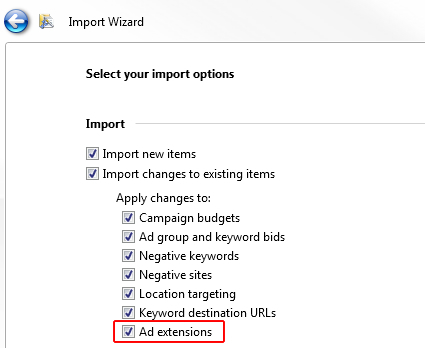 Similar to AdWords or Bing Ads, you have several options when targeting keywords. You can choose unordered match (which is similar to broad match), phrase match, or exact match. Unordered match will match your keywords, but those keywords can be in any order. Phrase match requires the keywords be in the exact order you list, but other keywords can be at the beginning or end of the query. And exact match requires a perfect match on the keywords you enter – without any other keywords in the query. Exact match is the most restrictive of the match types and is only available when you target the search results. 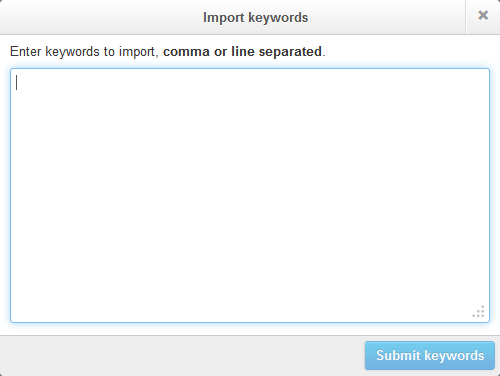 Note, you can also import keywords as comma separated, or line separated (which is a nice option for importing keywords from other platforms). If you are familiar with paid search advertising, then you already know the power of using negatives. Well, Twitter Ads enable you to include several types of negatives, including negative broad match, negative phrase match, and negative exact match. Note, negatives are only available when you target the search results versus users’ timelines. This makes sense, since most tweets don’t contain a few words (like a search query does). When you use a negative, it tells Twitter to not show your ad when the negative appears in a search query. When you use keyword targeting, you are setting up a “Promoted Tweets” campaign. So, you aren’t setting up ads. Instead, you are choosing a specific tweet to promote. That’s important to understand or you can make the mistake of tweeting out an ad-sounding message during the campaign creation process. 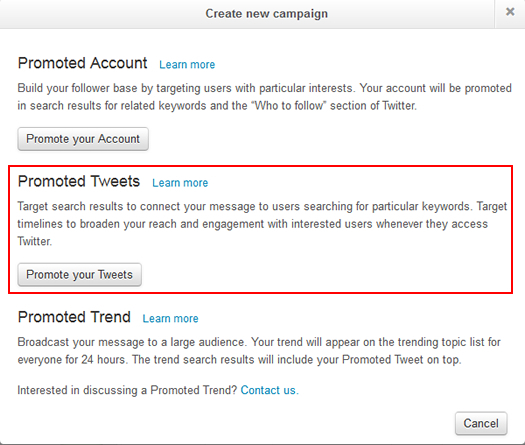 When you set up your keyword targeting campaign, you can select a tweet to specifically promote from your stream. You can also create a new tweet to promote, if that makes more sense for your campaign. And yes, that makes the most sense, since you will want to tag your destination URL’s so your analytics package can accurately report your campaign statistics. Once you choose your keywords, set negatives, and choose your promoted tweet, you can target your audience in a number of ways. For example, you can use location targeting to limit your promoted tweets to users in a specific geographic region. As of now, you can target users by country, state, and metro area. For example, you can target the United States, New Jersey, or the Philadelphia Metro area. Note, you cannot target at a smaller city or town level (at least yet). In addition to using location targeting, you can also target by gender. There are radio buttons for “any gender”, “male only”, and “female only”. Twitter infers gender by the tweets shared by users, by their profiles, and by their follow graphs. Using gender targeting, you can test response rates by gender (by splitting out campaigns by gender). That’s exactly what I did when setting up my first keyword targeting campaign. Keyword targeting campaigns also enable you to target by device. For example, you can target desktop and laptops, iOS, Android, Blackberry, and “other mobile devices”. You can use this targeting capability to split mobile and desktop campaigns, to target specific platforms, etc. At the bottom of the campaign setup screen are fields for campaign budget, daily budget, and maximum bid. You can also use standard or accelerated delivery for your daily budget, which will either spend your budget as fast as possible starting at midnight, or spread that budget throughout the day. When setting a maximum CPC, Twitter will supply a suggested bid range. Once you have entered your keywords, chosen a tweet to promote, set up targeting, and set your bid and budget, then you are ready to rock and roll. Simply click the “Create Campaign” button at the bottom of the screen to launch your campaign! Although many in the industry believe this is long overdue, I’m thrilled that Twitter has finally released keyword targeting for Twitter Ads. Over the past few days, I’ve been setting up various campaigns and testing performance, engagement, etc. I plan to write more posts in the near future, based on the results of my initial campaigns. So stay tuned. In the meantime, I recommend jumping in yourself. You can set up your first keyword targeting campaign today by following the instructions I included above. Good luck.